New proof Gold Eagles scored one of their best sales starts in recent years but they moved a lot slower out of the gate than a year ago. 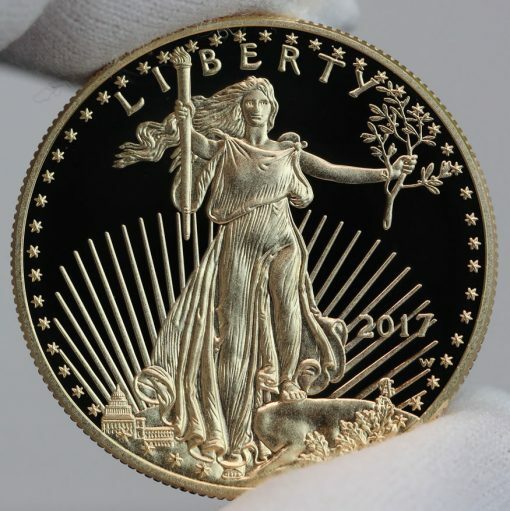 This CoinNews photo shows a 2017-W $50 Proof American Gold Eagle. Each coin is encapsulated for protection, and packaged within a velvet, satin-lined presentation case that also holds a Certificate of Authenticity from the U.S. Mint. This year’s collector coins had the unenviable task of launching in the midst of a bearish gold market, with gold now looking to stretch its losing streak to seven sessions in a row. There’s less incentive to buy early with the option of waiting on the sidelines for possible price reductions. In contrast, last year’s coins debuted at a bullish time with the yellow metal rallying to a more than 1-year high. 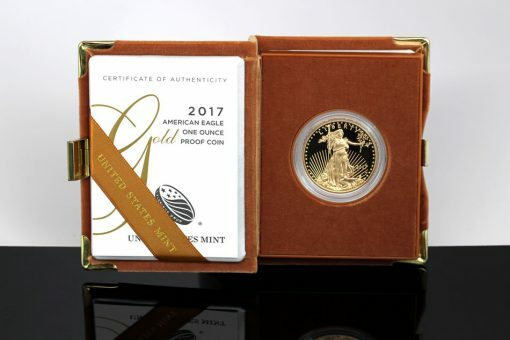 Released last Thursday in four sizes and in a set with one of each, collectors scooped up 27,013 coins in four days for a combined 12,807.60 ounces. Last year’s Gold Eagles in the same amount of time reached sales of 45,673 coins, or 21,362.15 ounces, for the strongest showing since 2010. Proof Gold Eagles are sealed in a protective capsule, as shown in this CoinNews photo. They are available in four sizes, as well as a 4-coin set. Early sales of the 22-karat gold coins spiked in 2010 with pent-up demand featured. 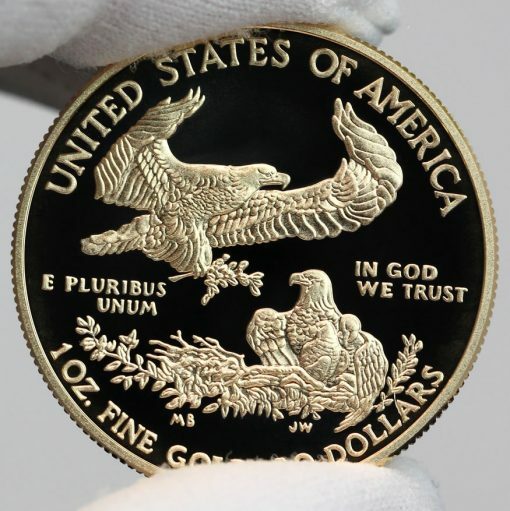 The U.S. Mint did not sell any proof Gold Eagles in 2009, diverting their production that year to bullion versions. 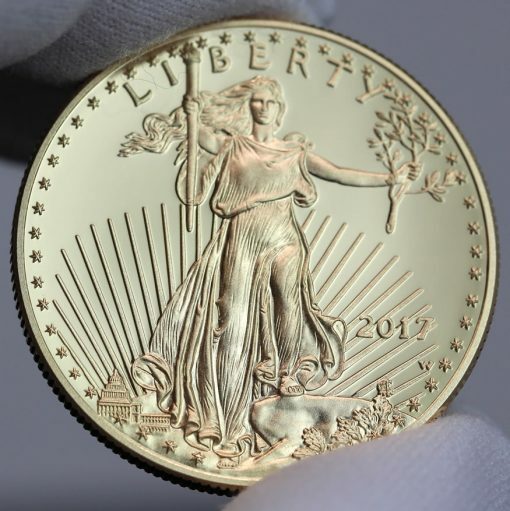 American Gold Eagles are minted in sizes of 1 oz., 1/2 oz., 1/4 oz. and 1/10 oz. with respective denominations of $50, $25, $10 and $5. The set with one of each was the biggest unit seller. 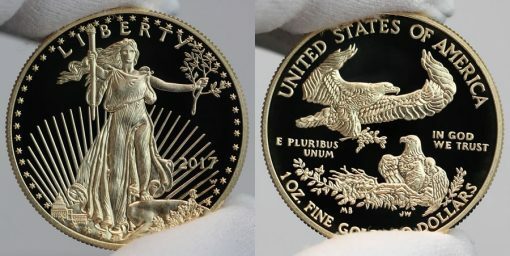 Finally, here are some CoinNews photos of a proof $50 Gold Eagle under varying light conditions. A photo of the proof American Gold Eagle’s obverse. 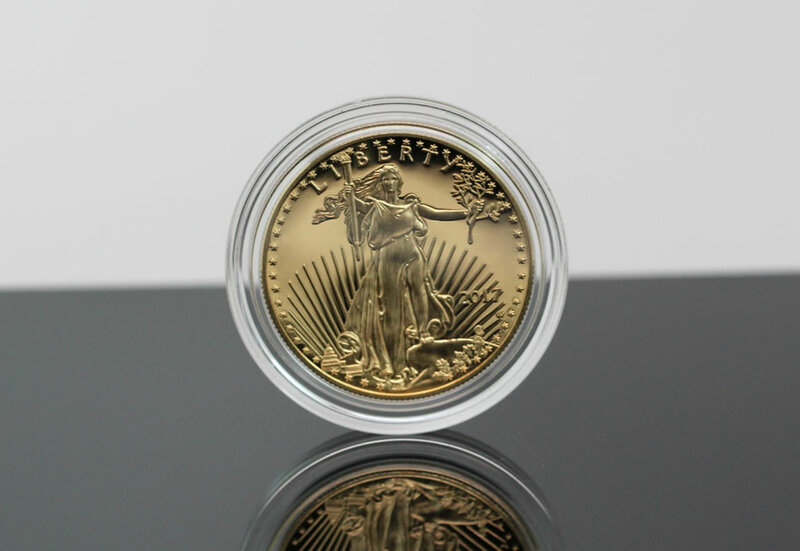 It features a modified design of Saint-Gaudens’ U.S. $20 gold coin design, “Standing Liberty”. A photo of the proof Gold Eagles reverse. Designed by Miley Frances Busiek, it features the “Family of Eagles” motif, symbolizing family tradition and unity. 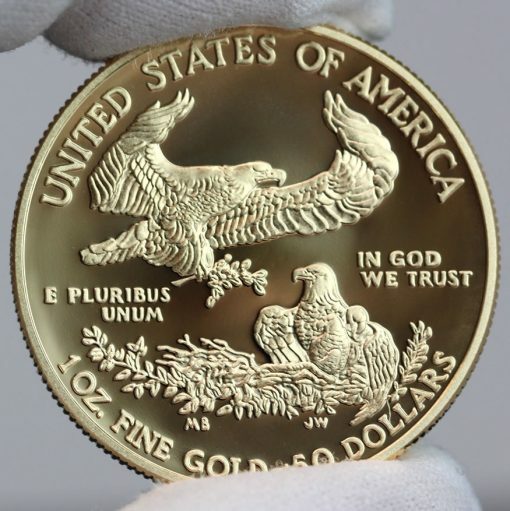 Proof American Gold Eagles are available from the U.S. Mint’s online page of gold coins, located here, or by calling 1-800-USA-MINT (872-6468). Nice set but way too expensive for me Maybe one day! !